Recently, I’ve become enamored with instant photography. I still mostly shoot and share photos digitally, but occasionally I’ll grab my Fuji Instax camera or an old Polaroid camera, take a few snaps and watch them come out of the camera and develop before my eyes. Digital photography has made it wonderfully easy to take huge numbers of images and share them with ease but sometimes there’s no replacement for the experience of holding a print in your hand. You (and my editor) are probably wondering why in the world I’m talking about cameras in an article that’s supposed to be about printers. It’s because, while we may not be printing as often as we used to, there still are times when nothing can replace the experience of printed output. I often find that when I’m working on a long article or report, it’s much easier to proofread the document on paper, even if I ultimately plan to share it electronically. I love to share photos online, but I also like to have prints to decorate my home and show to people when they visit. This month, our PCMag Readers’ Choice Award survey asked you about the printers you’re using. You rated your overall satisfaction with the printers as well as satisfaction with several key areas including ease of setup and reliability. We haven’t seen radical changes in printer technology in recent years; it’s a mature market and that means you can get excellent features and output at affordable prices. The primary technologies are inkjet and laser (both color and B&W). The vast majority of printers rated were multifunction (aka all-in-one) devices that can copy, scan and, in some cases, fax, in addition to printing. Most printers now are easily shareable. Nearly 70 percent of our respondents who use a printer at home say that it’s set up so that multiple people can print to it. The printers are primarily shared over Wi-Fi (67 percent) or Ethernet (20 percent). Network sharing has not only made it easier to print from the computers in your house, it’s also made it easier to print from smartphones and tablets. In some cases, you can even send jobs to the printer while you’re on the road and have the documents waiting when you get home. Another way to keep cost down is through ink replenishment programs. Certain printers are now capable of notifying the manufacturer or a retailer when they’re low on ink and automatically ordering replacements. In exchange for being the automatic vendor for replacement cartridges, the manufacturer offers discounted prices on the ink. When you buy a printer, you want to choose one that you’ll be able to use for a long time without giving you agita or breaking the bank. Read on to see which brands can deliver and which ones are struggling to keep up, at least according to PCMag readers. 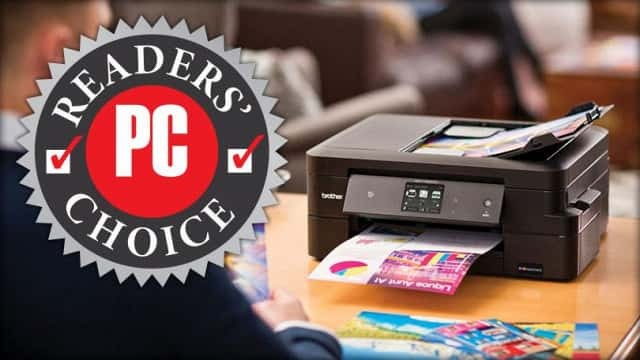 The PCMag Readers’ Choice survey for Printers was in the field from June 4, 2018 through June 25, 2018. For more information on how the survey is conducted, read the survey methodology. Each person who completed the survey was entered into a drawing to win an Amazon.com gift card valued at $350. Next article Canon Vs HP Vs Brother: Which Printer Is Right For Your Small Business?